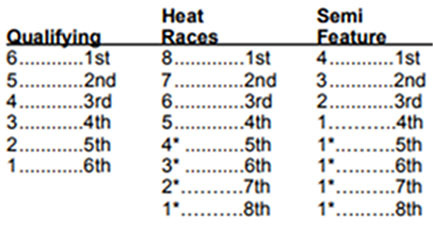 While iRacing apparently has not hammered out the details for their heat race format, there is some general information out there, obtained from iRacing staff, about how the heat race format will function, and this is what is planned. Official races will still be split by iRating, but the splits will probably be bigger. Some drivers will be eliminated from the main through heat races. Those drivers will lose iRating. For example, if 40 cars sign up for a race, there will be two splits of 20 cars each. 15 cars will start each main. Five cars will be filtered out of each split as they run qualifying, heat and consolation races. Those five cars that are eliminated from each split will have two put their virtual cars on their virtual trailers and go virtual home. If you get through qualifying or heat races and decide the field is too strong, you’re motivated to stay in for the feature by the potential loss of iRating. Just as it is now, there will be a maximum number of cars allowed for each split and that will vary by series. The number of cars allowed to start the feature will also vary by series. For example, maximum 24 cars per split, maximum 18 start the main. Drivers will get new cars after each session. So if you crash in a heat or a consolation race, you start fresh in the next session. For Rookie classes I would expect to see unlimited fast repairs or resets, and one fast repair for D class races, at least in the feature races. That’s just a guess on my part but that’s the way it is now so I wouldn’t expect it to change. The top qualifiers and finishers will receive a small number of championship points. Those points have no influence on the progression through the event. Points will always be scored in the feature and will be computed the same way they are now. Feature points vary based on the Strength of Field and the field size. Drivers that did not make the feature are not considered for the Strength of Field or field size calculations. Your points for the entire event will be used to determine which of your races are kept or dropped for the week. iRacing plans to use the USAC points system for qualifying, heats, and consolation races, as shown in the image on the right. Heat race formats are planned for the 2017 Season 4 build coming in early December.